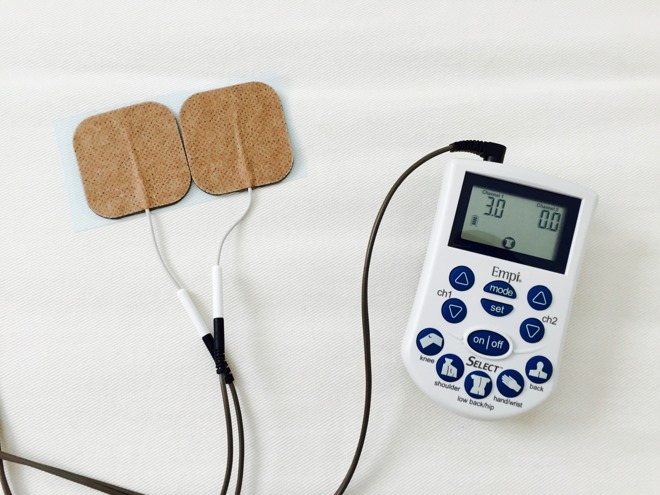 TENS, or transcutaneous electrical nerve stimulation, is a pain treatment that uses low voltage electric current to relieve pain. It can be used for pain relief, for relaxtion after intense exercise, or even used as a passive exercise. 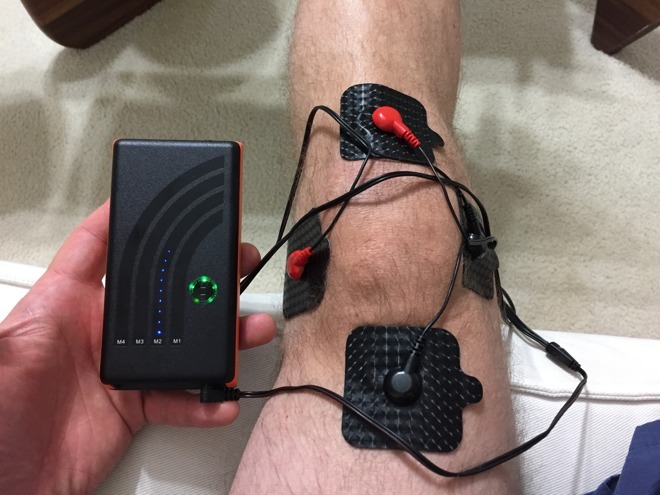 "(It's) a safe, ultra-portable and effective electronic muscle stimulator in treating muscle aches," The Indiegogo page reads. "Its size and weight resembles that of a smartphone. Using its proprietary technology, U-GYM Mini provides the same effective, human-like massage and helps you relax by reducing muscle pain and lowering stress. Use U-GYM Mini anytime, anywhere, to improve your quality of life and work productivity!" I have used a prescription TENS unit for ages, so I have a basis for comparison with the app-enabled unit. U-Gym provided their first unit for review, while they work on making the new U-Gym Mini shown on the crowdfunding campaign. The U-Gym unit provides a similar stimulation as the unit I've been using for some time. The difference is, the U-Gym unit is more compact than my normal unit, can be adjusted from an app on the iPhone over Bluetooth Low Energy, and can manage 4 electrodes from one wire, unlike my unit which requires two cables to control 4 electrodes. The forthcoming Mini unit will be more similar to mine, and will use a wire capable of managing 2 electrodes at a time. Comparing the two, my unit puts out 0-2500 Hz, the U-Gym unit provided will do between 1000-8000 Hz, and the U-Gym Mini will do 1000-8000 Hz. What this boils down to is both how slow or quickly the pulsations of electrical stimulation can hit, and what they feel like. Lower frequency stimulation feels more like stinging on the skin, where the higher frequency is more like massage or accupressure. For most uses I prefer the higher frequency, with the exception of relaxing muscle following exercise, where I like to alternate between gently and strong pulsations. As a TENS unit, it worked quite well. The manual gives advice on where to place the electrode pads, and what default programs might be appropriate. The U-Gym tested has four programs, and the forthcoming U-Gym Mini has 2 default programs for muscle relaxation. used to relieve pain and fatigue using deep-tissue massage. used to relieve muscle stiffness after sitting or standing for a long time. 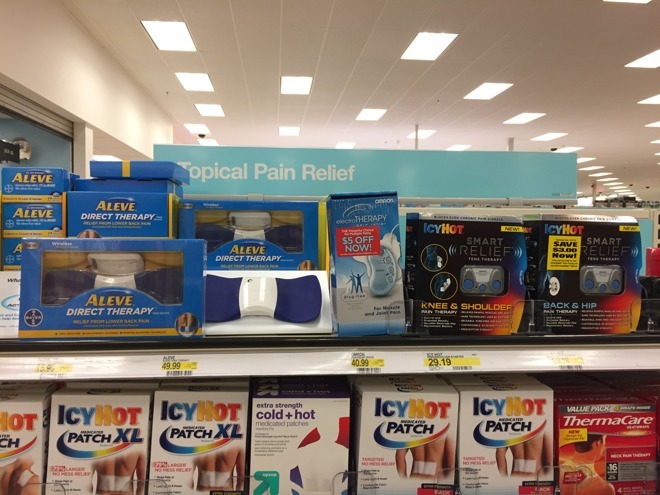 Units are sold in pharmacies and retail stores for pain relief, but I've never really given those much consideration. The U-Gym unit really surprised me with how well it compared to my much more expensive unit. The manual shows different electrode placement for the different programs, and at backer packages starting at $69 to receive the device is a very good deal. Retail is set at $149 currently. The U-Gym product works well, and compares favorably with TENS units that cost almost five times as much. The manual isn't bad, and the app could be a little more refined, but on the whole, it gives a new user what they need: places to put the electrodes, and advice about which program of pulsations might be used for. The U-Gym Mini begins at $69 from Indiegogo.